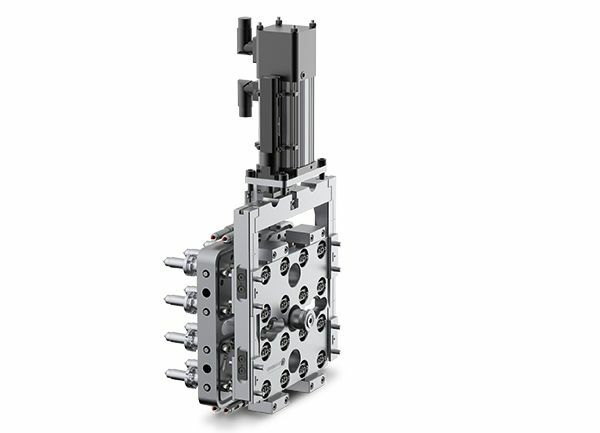 GÜNTHER Hot Runner Technology offers its valve gate systems for small mould dimensions as an outstanding solution for precisely the kinds of high-quality applications required in modern plastics. As these drive concepts for valve gate technology can be controlled with a high degree of precision, they are ideal for producing items which require consistently high gate point quality. Modern plastics are subject to a host of different requirements. Customers in the consumer goods and packaging fields want an attractive design and perfect surfaces with a pleasant feel. Medical technology and electrical engineering require moulded parts with complex geometries, often with minimal wall thicknesses. Items which meet these needs can only be created using very stable processes which guarantee maximum precision. Innovative needle guide and shut-off needle design geometries result in low-wear operation and a long needle guide service life. The sliding mechanism used on systems with a greater number of drops enables tight cavity spacing of 9 millimetres or more and precisely synchronised opening and closing of the needles thanks to its mechanical coupling. Valve gate systems with up to eight needles are optimally outfitted with a lifting plate system. The drive can be either pneumatic or hydraulic as desired. Hot runner nozzles with melt channel diameters from 4 to 12 millimetres are used with both system versions. Adjustment of the needle position can optionally be carried out while installed. Special openings in the mould clamping plate and the needle suspension with adjustment thread and adjustment nut enable individual position setting of the shut-off needle from the outside. Thanks to the front installation of the NTT nozzles, they can be easily replaced for mould separation. Easy replacement of all wear parts makes GÜNTHER valve gate systems even more attractive to use. GÜNTHER is a technological leader in the field of hot runner technology. With over 220 employees, they produce innovative and user-friendly hot runner nozzles and systems for the plastics industry at their Frankenberg, Germany location and sell them at more than 40 representative locations around the world.